Anyone who boats or fishes should make note of some recent changes in Michigan’s Natural Resources and Environmental Protection Act geared toward preventing the spread of invasive species and supporting natural resources stewardship efforts for the future. An effort to permanently protect 1,453 acres of prime wildlife and riparian habitat in Washington is complete after the Rocky Mountain Elk Foundation recently conveyed the final parcels of land to the Washington Department of Fish and Wildlife (WDFW). Registration is open for the 10th Annual Native and Wild Trout Conference on Thursday, April 11 from 9 a.m. to 4:30 p.m. at the Arizona Game and Fish Department headquarters in Phoenix. The TrueTimber trailer will be hauling new and popular products to the Bristol Motor Speedway this weekend to give race-goers an opportunity to buy TrueTimber gear in a variety of the brand’s most sought-after camouflage patterns. Have dinner while learning about distilling history at Spring Mill State Park’s first dinner in the grist mill of 2019, which will be on April 27 at 6 p.m. The Arizona Game and Fish Department will be hosting a public meeting Tuesday, April 9, to discuss game management objectives in the Tonto National Forest, including areas near Payson, Globe and the Mogollon Rim. Help get rid of invasive species while possibly earning a free pass to Spring Mill State Park for the rest of 2019 at the park’s garlic mustard pull on April 13 from 9 to 11 a.m. Teaching children a lifelong hobby, instilling appreciation for our marine environment and providing fun, family outings are the objectives for the Kids’ Fishing Clinic in Pensacola on April 13. Sturm, Ruger & Company, Inc. (NYSE: RGR) introduces a new, compact version of the popular Security-9 pistol. The Security-9 Compact has an overall length of 6.5" and weighs in at just under 22 ounces. At its meeting this week in Biloxi, Mississippi, the Gulf of Mexico Fishery Management Council took final action to modify the red grouper annual catch limits and annual catch targets. The Gulf of Mexico Fishery Management Council has selected to reduce the allowable shrimp effort to 60% below the baseline years and revise the framework procedure to allow future effort reduction goals through the standard open framework documentation process. The Gulf of Mexico Fishery Management Council met this week in Biloxi, Mississippi, and voted unanimously to delegate management authority of the private angling component for recreational red snapper fishing to each Gulf state, beginning with the 2020 fishing year. DeSantis Gunhide introduces ten holsters made for the Taurus G2S and G2C pistols. These include the Mini Scabbard and Cozy Partner. Lyman Products introduces the Pachmayr Alume Series grips by Raffir for the 1911. A master of materials, both natural and composite, Raffir is a Danish company with over a decade of experience in developing and treating materials. Friends of the Kaw is pleased to announce it has been awarded a grant from the MDRT Foundation through their Worldwide Grant Program. This grant is awarded to assist Friends of the Kaw with the project “The Great River Cleanup: Recover & Restore the Kaw”. At its February meeting, the Florida Commission approved rule changes for 2019-2020 regarding FWC-managed public hunting areas and statewide hunting, including many dealing with deer hunting. The hunting of female mountain lions in southcentral Montana hunting district 511, which includes portions of Wheatland, Fergus and Golden Valley counties, has been re-opened to the hunting of female mountain lions. There are private properties available to hunt through the Hunting Access Program – find a complete list at Michigan.gov/HAP. The HAP webpage includes details about enrolled properties, including types of hunting allowed and aerial photos of the properties. Hornady has been granted two utility patents related to the RFID technology used in their premium line of RAPiD Safes. Hornady began incorporating RFID in lock boxes in 2013. Walther Arms and Panteao Productions announce the release of the new documentary, “The History of Walther.” In the twenty-two-minute documentary, Larry Vickers with Vickers Tactical, ventures to the Walther Factory in Ulm, Germany. The Outtech team continues to grow and expand and is proud to announce the addition of Dan Yohann to our Outdoor team. Dan will be working with accounts in Wisconsin and Minnesota. Barnett Crossbows was honored as the top-selling crossbow brand in 2018 according to the latest report by Southwick Associates. The National Shooting Sports Foundation applauded the introduction of H.R. 2079, the Freedom Financing Act in the U.S. House of Representatives by Congressman Roger Williams (R-Texas). The legislation would ensure large financial institutions cannot deny service to certain constitutionally-protected industries that are fully compliant with all laws and statutes. Viridian Weapon Technologies has expanded its popular X Series Gen 3 offerings to give long-gun users the X5L-RS Gen 3 green laser sight and taclight for rifles and shotguns. The all-new X5L-RS Gen 3 models are now shipping. ERGO is proud to be a National Sponsor for A Girl & A Gun’s Conferences, include the upcoming IMPACT National Conference which sold out quickly. The IMPACT Conference brings together more than 400 A Girl & A Gun members from around the country. The Scholastic Clay Target Program would like to recognize its continued sponsorship by Kolar Arms of Racine, Wisc. in support of the youth shooting sports. Kolar Arms is a Wisconsin based manufacturer of high-quality shotguns. Ducks Unlimited recently announced their top fundraising chapters across the nation honored in four categories: Chairman’s Elite, Chairman’s Roll of Honor, President’s Elite and President’s Roll of Honor. At the close of the enrollment window on April 1, 31,251 students were nominated by their coaches as National Archery in the Schools Program Academic Archers from 47 US states, 3 Canadian provinces and two other countries. RISE Armament will be offering attendees of the Wanenmacher’s Tulsa Arms Show the opportunity to receive a free special-edition RISE Armament Oklahoma t-shirt or a RISE Armament logo t-shirt. This week on The Revolution with Jim and Trav it's Adventure Reload, as the boys talk firearms, ammunition, concealed carry and an amazing expedition. Tune in to this week’s Bass Pro Shops Outdoor World Radio show as host Rob Keck focuses on safety in youth firearm shooting. Keck has three outstanding guests from the National Shooting Sports Foundation. It's positive developments in two different gun rights legal cases - one in New Jersey, one national. Plus, encouraging new hunters and shooters to explore the outdoors, an initiative from a California gun group to help women learn how to protect themselves, and more, this week on Tom Gresham's Gun Talk Radio. Enjoy the exceptional night sky during International Dark Sky Week, March 31-April 7, at state-designated Dark Sky Preserves located within six Michigan state parks. Houston Safari Club Foundation (HSCF) is now accepting collegiate scholarship applications for its annual Dan L Duncan Scholarship award program. Houston Safari Club Foundation is committed to furthering the education of students pursuing a career in conservation. New 3-dimensional and field archery targets at the Triple N Ranch Shooting Range give bowhunters and those who want to fine tune their competitive archery shooting skills a great place to practice. Winchester adds to its long-standing commitment to the shooting sports with the title sponsorship of the National Sporting Clays Association Championship Tour. The Pope and Young Club recently reaffirmed their staunch support of youth conservation efforts by naming the Scholastic 3-D Archery Association as the recipient of a $10,000 sponsorship. Visit Goods4mi.com and you'll find centennial keepsakes and merchandise, coffee, wine, running gear and more. Even better, every time you make a purchase, a portion of the proceeds is generously donated back to state parks, trails and waterways. Indiana's Turkey Run State Park recently joined a number of state park properties listed on the National Register of Historic Places. Alabama State Parks will conduct a prescribed burn in an area of longleaf pine at Wind Creek State Park in April 2019, weather permitting. The burn will take place adjacent to the park's main entrance on the north side of Alabama Highway 128. When you buy a hunting or fishing license you’re supporting conservation. Every licensed participant increases the amount of federal grant funding Florida receives through the Wildlife and Sport Restoration (WSFR) program. The Nebraska Game and Parks Commission is soliciting public input for motorized boat ramp improvements at Lake McConaughy’s Martin Bay and Cedar View. Game and Parks will receive input through April 15. This weekend on Discovery Channel, you’re not going to want to miss new programming from Uncharted Waters with Peter Miller, Booger Bottom USA, Jimmy Houston, Local Knowledge and more. Next Wednesday, April 10, the Congressional Sportsmen’s Foundation (CSF) will host a Capitol Hill Breakfast Briefing to cover progress on Wildlife Migration Corridors following the signing of Secretarial Order 3362 last year. On Tuesday, 37 days after having laid a single egg for the fourth time since Jan. 21, the female eagle, perhaps sensing an abnormality, chose to destroy the egg. The typical incubation period is 35 days. The Michigan DNR Outdoor Skills Academy is offering a turkey hunting clinic Saturday, April 13 at the Carl T. Johnson Hunt and Fish Center in Cadillac. Today's feature is from Civilian Marksmanship Program. Zachary watched as his dad and grandpa competed. 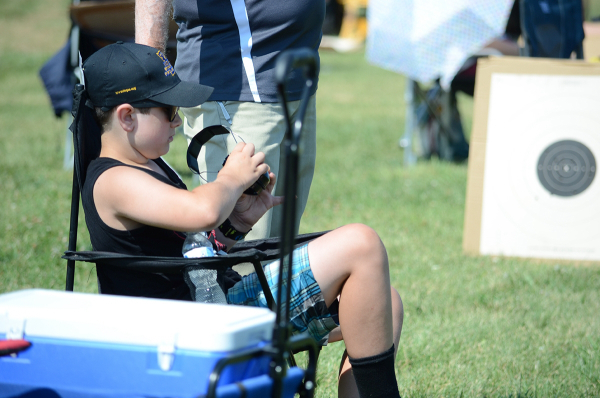 CAMP PERRY, Ohio – Zachary Wehner, 11, of Valparaiso, Ind., took his first trip to the historic National Matches at Camp Perry last July, 2018. During his self-tour of the grounds of the Camp Perry National Guard Training Base, which has been home to the National Matches since 1907, Zachary found his way to the Gary Anderson CMP Competition Center. The facility, maintained by the Civilian Marksmanship Program (CMP), contains many fascinating findings within, but most visitors come for its 80-point electronic indoor air gun range. 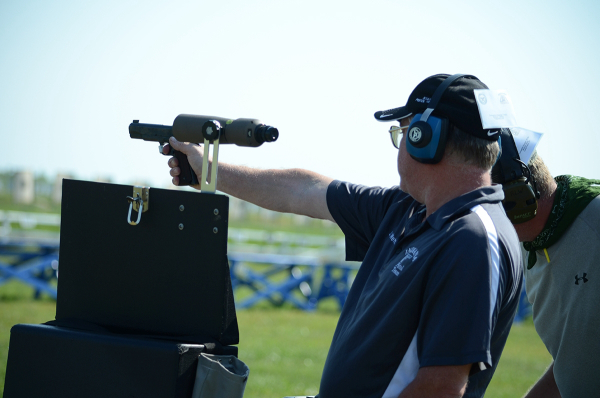 The range is open to the public all year long and hosts numerous events. The National Matches season gives guests the opportunity to not only try their hand at air rifle or air pistol at their own pace, but also allows anyone the chance to compete in national-level competition. That’s exactly what Zachary did, competing in the 30-shot sporter Bench League, where individuals fire upon the electronic targets from a fixed, seated position. It was his first time trying air guns, having only fired BB guns in Cub Scouts before getting to Camp Perry. Zachary didn’t come alone on the National Matches adventure. He brought along with him two other generations of the Wehner family, his dad, Jeffrey, and his grandpa, Gerald. The idea of a three generation trip originally started with Gerald, a regular to the National Matches since 1967. Gerald fired in the 2018 National Matches pistol events using a National Match .45 he had bought at the event years ago. It’s one of many firearms he has accumulated over the years. “I’ve been interested in shooting all of my life,” explained Gerald, 80, an avid pistol marksman. Left to right: Gerald, Zachary and Jeffrey Wehner. Growing up, his brother was the one who got him interested in shooting. Gerald’s first gun came in the third grade – a BB gun his brother gave him after he upgraded to a .22 rifle. A few years later, his brother upgraded again, this time to a shotgun, and Gerald quickly saw an opportunity. “And I’ve still got that gun,” he said as he smiled. When Gerald was a senior in high school, he bought a single-action revolver for $49 from Colt Frontier Scout. In a moment of shear happenstance, that summer, as he was telling his dentist about the new revolver, the dentist asked Gerald if he would like to shoot on a real marksmanship team. Apprehensive at first about what he was getting into, Gerald decided to give the team a try and bought a high standard target pistol for $35 later that summer. “I had to aim it sub-six because of the sights,” he recalled. “I was very proud of that,” he chuckled. Jeffrey Wehner also competed at the 2018 National Pistol Matches. Later on, he moved on to a Ruger Mark I, moving up from a high standard, which he shot for several years before getting the National Match .45 at Camp Perry and a Clark Ruger in 1967. Along the way, Gerald gained a family, which made it harder to make the trip back to Ohio in the summer. 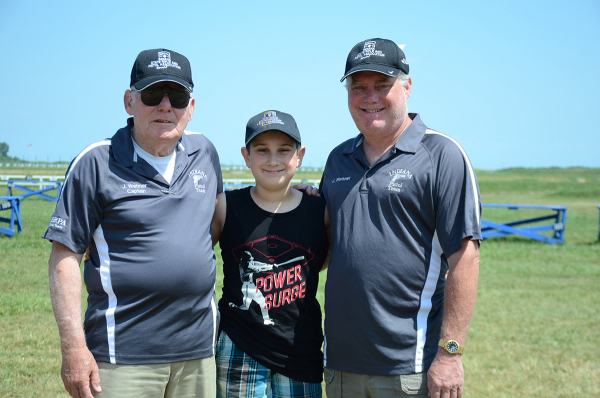 But, eventually, he and a new shooting buddy made it back to the Matches – his son, Jeffrey, Zachary’s dad. Jeffrey didn’t get interested until later in life, into his 30’s, when he started asking Gerald questions about the sport. The two started going out to the local range in Valparaiso, and also visited Bristol and regional events before eventually making it to Camp Perry. “We were just talking about it one day, and he wanted to know if I wanted to come, so we made an agreement,” Jeffrey said. Making a weekend trip out of the arrangement, young Zachary wanted to come along as well. And, with his first successful air gun competition under his belt, they were almost unable to get him to leave. Now hooked, Zachary is looking forward to coming back out to shoot with his dad and grandpa at this year’s National Matches. Jeffrey is also onboard with the idea, ready to make a tradition out of the trip. SIGN UP FOR THE 2019 NATIONAL MATCHES TODAY! VISIT HTTP://THECMP.ORG/COMPETITIONS/CMP-NATIONAL-MATCHES/ FOR SCHEDULES, INFORMATION AND REGISTRATION FORMS.